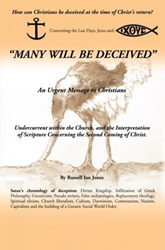 Russell Ian Jones’s new book, Many Will Be Deceived - An Urgent Message To Christians, ($33.49, paperback, 9781498433471; $9.99, e-book, 9781498433488) proves that there was a deceptive spirit throughout Church history to alter the original gospel message. He shows that Jesus made clear statements within the gospels that leading up to His return, many will be deceived by false teachers who will present a different gospel to which was given to the Early Church. Russell wants to clear up the deception by providing readers with a chronological historical view of the antichrist spirit that has obscured the original understanding of Scripture. He traces the history of how the evil one “Satan” uses lies and deception to falsify the true intentions of God. This is a very thorough piece of writing by an author who has no doubt done extensive research regarding this often-controversial topic. Russell Ian Jones is a Biblical apologist, having served 5 years as the State Coordinator of ‘Answers in Genesis’ (now known as C.M.I. Creation Ministries International) in Perth, Western Australia. He has a strong interest in Science and history, especially the question to the why, how and where the origin of various beliefs come from and who’s telling the truth? This has also led him to the question why the Church today is so divided when the Bible is supposed to be their authority and reference map to God’s plan to restore His fallen creation. Russell has found that many of the answers to denominational differences can be found within the suppressed writings of the Ante-Nicene Fathers, who were the first Biblical apologists and defenders of Christ’s teaching of the first three hundred years. Xulon Press, a division of Salem Media Group, is the world’s largest Christian self-publisher, with more than 15,000 titles published to date. Retailers may order Many Will Be Deceived - An Urgent Message To Christians through Ingram Book Company and/or Spring Arbor Book Distributors. The book is available online through xulonpress.com/bookstore, amazon.com, and barnesandnoble.com.